Kansas City is a wonderful place to live, but let’s face it. Energy costs can get kind of crazy sometimes. Winter temperatures drop into the low 20s and summers often bring scorching days of 90 degree heat. Because of the extreme temperature variations, it’s not unusual for homeowners to spend a few hundred dollars per month on energy costs. If you’ve dealt with high energy costs over the years, you’ve probably looked into getting an energy audit done for your Kansas City home. An energy audit can be a great way to discover what problems your home may have with insulation and energy efficiency. It can also be a useful source for finding ways to solve your energy problem, such as installing window film for your Kansas City home. However, if you’ve never had an energy audit completed before, you may have some questions. Below, we’ve provided some answers to frequently asked questions about window film and energy audits that our Kansas City tinting technicians have received over the years. 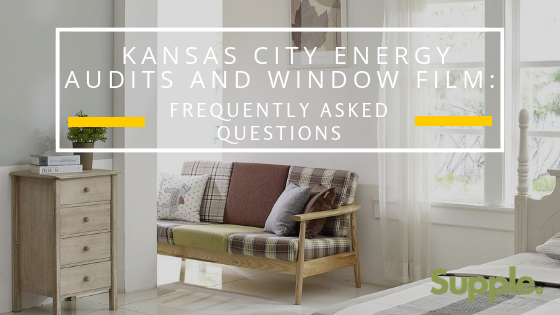 Considering installing window film after receiving your energy audit for your Kansas City home? These answers to frequently asked questions about window tinting may be able to help you with your decision. What is an energy audit report? An energy audit report is a document that details the results of a home energy audit. The report explains what issues are causing energy loss in the home, how these issues can be solved, and what the cost will be to make the recommended changes. Why does my energy audit recommend window film? Window film is one of the most cost-effective ways to make a building more energy efficient. Experts believe that about 30% of energy loss can be contributed to poor quality windows. By installing window film, you can improve the performance of your windows without having to replace them, which can cost hundreds of dollars. How much money will I save with window film? This is a very good question. After all, why go through the hassle of tinting your home windows if you don’t know that your efforts will pay off? To gain a better understanding of how much you’ll save, you can use an online calculator or schedule a consultation with your local window tinting contractor. Many homeowners in Kansas City are able to save up to 30% by installing window film. Improve the energy efficiency of your Kansas City home with window film. Call Green Light Window Films today to get more information on window film and energy audits or schedule a consultation for an onsite assessment.